On Sat. afternoon I saw Queen Bess by Sarah Bernhardt in Cinematograph, (with Leslie, Uncle, & Vera.) All very well; but it is positively painful to me not to hear speech; worse than the case of a deaf man at a proper Shakespere [sic] play; for all the finer play of mouth, eye, fingers, and so on, is utterly imperceptible, and so are the slower motions of the limbs spoiled, and their majesty lost, in the convulsed, rattling-hustle of the Cinema. Certainly, the old impression of driving through an electric hailstorm on a chinese-cracker is not now so easily got, as of old; but, still, I cannot enthuse over the things as Leslie does. His infatuation would speedily vanish if he knew ‘the real thing’. Which, poor fellow, he hankers to do. Comments: Wilfred Owen (1893-1918) was a British poet and soldier, renowned for this poems of the First World War. Les amours de la reine Élisabeth (France 1912) was a feature film (four reels) developed out of the stage play by Émile Moreau. Its high prestige value and heavy promotion by Aldoph Zukor (who founded Famous Players to distribute it and later formed Paramount Pictures) led to the film’s great commercial success. 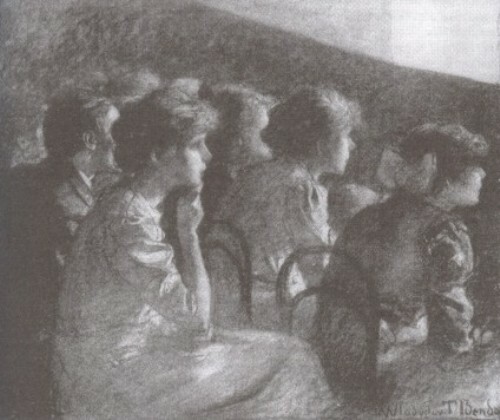 Owen’s reference to the poor quality of some early film shows indicates that he had seen films on a number of occasions. Susan Owen was his mother. Leslie Gunston was his cousin, also a poet. My thanks to Lucie Dutton for having brought this diary entry to my attention. This entry was posted in 1910s, Letters, United Kingdom and tagged Cinemas, Historical films, Les amours de la reine Élisabeth (1912), Performers, Wilfred Owen. Bookmark the permalink.